Puzzle #12: How Many Routes? 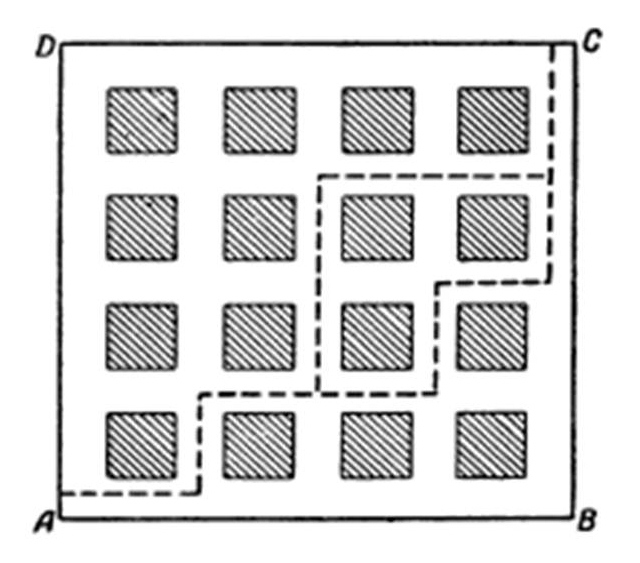 This is a puzzle from the book “Moscow Puzzles”, and the book borrowed this puzzle from one of the Mathematical Circles, a unique Russian way of making learning of Mathematics more fun through puzzles. How many different routes can we draw from Point A to Point C, moving only upwards and to the right? Different routes, of course, may have portions that coincide, as in the figure. Suggestion: For children below 12 years of age, try the same question with a 3×3 grid instead of a 4×4 grid; For below 8 years, try it with a 2×2 grid. There are some very neat solutions to this, so please try! This entry was posted in Puzzles and tagged Alok Goyal, combinatorial puzzles, recursion. Bookmark the permalink.